Women sewed waterproof “raincoats” using the gut (intestine) of any large sea mammal. The design includes a hood with drawstring. 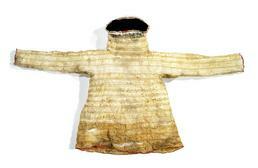 Men always wore this chigdax^ [gut parka] or kamleika (Russian) in their kayaks to keep dry, usually with a birdskin parka underneath. Mary Bourdukofsky: Chag^talisax^, yes, but they usually used to call it a kamleika. (2) In my time, I never saw anybody wear this kind of chag^talisax^ or kamleika. It could be in early 1900s that in the Aleutian Chain they were still wearing them. Maria Turnpaugh: I think old George Berrinon used to wear it once in a while, but I’ve never seen anybody else that I can remember. We had one in our house when we left, but it was gone when we came back, after the evacuation. Aron Crowell: Were these just worn by men? Aron Crowell: So from what you heard, were these used when you were out in a kayak? Vlass Shabolin: In a single kayak or a three-man kayak. Maria Turnpaugh: The bottom used to have a drawstring, and you’d tie it around the opening of the kayak so the water wouldn’t come in there. Notice that there its neck part is longer where you would pull the drawstring tight. Aron Crowell: So you would wrap the hood tightly around your face with that string? Mary Bourdukofsky: Yes, that’s a drawstring. Vlass Shabolin: It tightens up around your face and makes it more seaworthy, because the water won’t come down through your neck, like if you had elastic around your raingear. Aron Crowell: We haven’t looked at the hoods closely. Did the other ones have the strips that are going forward like this [seams running vertically down hood]? Mary Bourdukofsky: Yes, curve it down or else it’ll be pointed. Aron Crowell: And how were the intestines prepared? Mary Bourdukofsky: Cleaned and blown up. Dried in the air, in the sun. They don’t cut them until they dry up, and then they split them open. Aron Crowell: Sea lion intestines? Maria Turnpaugh: I don’t think we had ugruk around where we came from. Mary Bourdukofsky: Sometimes they’ll find it around Pribilof Island after a big storm, and people used to take parts of it for some uses. 1. The section includes comments from the discussion of gut parkas E383185 & E008943. 2. According to Mary Bourdukofsky and Vlass Shabolin, a kamleika is a “gut parka” or “rain parka” and can refer to rain gear in general. It comes from the Russian term kamleĭka. 3. This section is from the discussion of gut parka E383185. 4. According to Vlass Shabolin and Mary Bourdukofsky, fur seal intestines were usually used to make kamleikas. The Aleutian design was always constructed from horizontal strips, with a hood that was made separately and stitched on. (4) There are drawstrings at the hood and often at the wrists, but men also wore bracelets to close the sleeves. (5) Skilled seamstresses made completely watertight seams by using fox or whale sinew thread, a double fold, and a combination of running and overcast stitches. (6) Fine bird or fish bone needles were traditional, before iron ones became a Russian trade item.